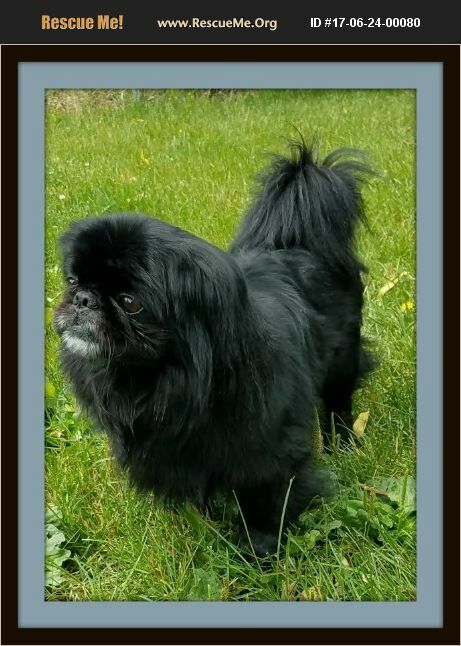 Illinois Pekingese Rescue View other Pekingese for adoption. Well, bust my buttons, our perfect little boy has been returned! But, it is a good thing and his adoptive family was so kind in that they put Freddy's needs first and drove umpteen miles to bring him back to foster care. Lil' Freddy was just a bit too active and playful for his adoptive home and their own dog was just no into that much playtime. Despite the people tossing toys and playing with him Freddy really needs a bit more active family. He would lay on the back of their couch and look longingly out the window at the nighbors children playing outside. How sweet. Since coming back to us he is a fairly active guy and does love his toys and found a couple of buddies to pal around with. They just came back in all out of breath, carrying a rope toy, with little grins on their faces I am sure!! So now, Fredrik von Snuffles is looking for a new kingdom, a castle that he can call home. Well, it does not even have to be a castle just a fine place with people that will adore Fredrik. (His friends call him Freddy) Freddy has come to be a sweet, silly, playful boy. He loves to sit in your lap, get a good belly rub, and snuggle up for TV. He is not fond of big hugs to the face, I am not either-lol, but young children do not understand that so we are looking for a home with older kids. We adore this big boy,he fit into our busy home like a champ. He is 2-3 years old. His adoption fee is $325, please email Kristine at joysparrows@gmail.com.